A huge amphitheater bordered by mountains. Below, in the depths of the valley crossed by the Medellin River, buildings signal the city center, highways full of cars, and as your gaze ascends the slopes, thousands of huddled houses hanging from cliffs, ravines, and gorges. Waves of migrants have tamed the hillsides, making them into a kind of vertical city. Double migration. Historical, from countryside to city, which began during La Violencia (1946-1958), the period that plunged the country into a civil war between liberals and conservatives, with a total of 200,000-300,000 killed. By 1957, the violence subsided, but not the persecution of the peasantry, creating the conditions for a resurgence of conflict with the emergence of the guerrillas in the 1960s. But the violence continued displacing hundreds of thousands of campesinos from their lands coveted by landowners, drug traffickers and paramilitaries. The last wave of violence was recorded in eastern Antioquia, between 1998 and 2007. The seven- year conflict left the earth razed, according to a detailed study of the San Carlos municipality, 100 kilometers from Medellín. The rate of depopulation of the town is mind-boggling. In 1985 it had 29,156 inhabitants; in 2005, 13,000. 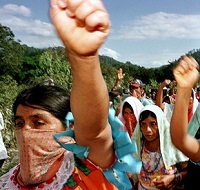 It’s been described as “a war dance,” in which “the paramilitaries indiscriminately massacred the inhabitants of the municipality, while the guerrillas attacked the centers of all towns in the region, clashed with the army in rural areas, and killed villagers they considered to be informants or helpers of the paramilitaries,” according to researcher Carlos Olaya. There were 36 massacres in this small town. At the rate of four per year, over 500 people were assassinated and 152 disappeared. The combatants left the bodies of the victims on roads, streets, and sidewalks to teach others a lesson. At the height of the war, up to 80% of the population fled to other municipalities; some returned when the killings abated in 2007. The mountainsides of Medellín were gradually populated as the displaced people began arriving, with nowhere else to go. Four out of ten people inhabitants had been displaced by the conflict. The social classes are defined by geography. The poorest live in districts furthest from downtown. Those closest to the summits were the last to arrive. The small bus climbs the slopes with a hoarse groan, making sharp turns on a winding, narrow avenue. It runs into some slow traffic, with dozens of passersby crossing and walking alongside the avenue, alongside other vans, garbage trucks and goods being delivered. It has been an hour and a half since we left San Benito in the downtown center, when brick houses and tin roofs began to thin. We enter the highest part of commune 3, Bello Oriente neighborhood, from which you can catch sight, down below, of the city center, above the western slope littered with houses, and on the horizon, the green and misty peaks. We get out in front of a house in the middle of a meadow, a community hall where some fifty people—eighty percent women–wait for the meeting to begin. The two-story house is called Paradise; the community has had it for 18 years. There, social movements and collectives gather on the slopes and hold bazaars for clothing and appliance exchange. There, the area’s farm network meets, and the various groups operating in the neighborhood put on food festivals to raise funds. The meeting begins. Everyone introduces themselves and their collectives: youth in communications (Smoke Signals), women rights promoters (Adventurous Women), the Neighborhood Social Network of Bello Oriente composed of various groups and institutionsเล่นคาสิโนออนไลน์ให้ได้เงิน, cultural and artistic groups, university students, the Comuna 13 Committee of Displaced People, and Inter-neighborhood Board of the Disconnected. “What they scheme, in reality, is to sell the city to foreigners and tourism,” says someone who considers herself an “intra-urban” displaced person, because she had to leave her home in the city center because she couldn’t continue to pay rent. But she clarifies that some of her neighbors suffered three or even four displacements, first from the countryside to the city and then within the city, moving around until finding space in Bello Oriente, from which [the municipality] now wants to evict them. Bello Oriente has 5,000 inhabitants. 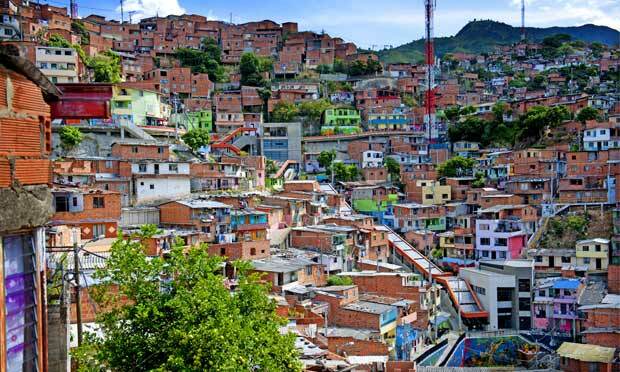 It’s part of – with five other neighborhoods – the so-called Franja Alta of Comuna 3-Manrique, 155,000 inhabitants. Franja Alta, of some 30,000, is the most recently populated area; it has the poorest services or none at all, and it is the one the municipality wants to displace. About 55% of the population was displaced by the armed conflict; most are informal and unemployed workers . Most of the families are made up of women, teenagers, and children, and don’t have titles to their homes. And many have been disconnected from services like water and electricity because they could not pay. According to a 2013 report, the streets “have been built by the inhabitants by community banquets, or convites, and the community “has improvised unconventional craft services such as community sewers, informal connections to street lamps, and communal aqueducts of untreated water”. This extensive network of collectivities also includes training and educational spaces, informal exchange markets, and community and family vegetable gardens. Some began with support from municipal programs, but after some time, continue on without it. Most of Bello Oriente is about 200 meters from the community house: a large 100 x 50-meter space where 12 families work. “It is worked communally, a portion [of the bounty] is for the families and the rest is sold,” says an elderly man who comes from the countryside and is happy to work land again. One of the inevitable comments from community members refers to los muchachos. If the community network is a kind of popular power, the muchachos embody the opposite. They are wrapped up in “para-mafia structures” such as Autodefensas Gaitanistas of Colombia, also called “Urabe?os.” This group exerts strong territorial and social control and, in fact, is a co-government on the hillside. Where the state has little presence, paramilitary bands or combos are an anti-popular power, allied to the powerful above. There are about 350 combos in Medellín, in which 13,000 muchachos are involved. They control 70% of the city. In Bello Oriente, a group called “The 30”, that also wields control over several surrounding neighborhoods, is “a living example of this territorial, social and economic control.” The armed group mixes small scale drug-trafficking with the business of “vaccines” (illegal taxes) for shops and the sale of eggs, Ibiza brand cigarettes, arepas, gas, and public transportation . They operate under cover of “providing security,” but if you don’t cooperate with them, you may end up in a ditch with a bullet to the neck. They dominate gathering centers, and through their control of the “mobile center for reconciliation and coexistence,” they resolve marriage, debt, territory problems and even the inevitable gossip. All through threat. An example. Two years ago, they convened a meeting of small arepas companies and informed them that the “vaccine” was going from 50,000 to 300, 000 pesos (USD $20 to $120). Many couldn’t afford [this rate], and the result was that “of the ten small arepas companies that operated in Bello Oriente, no more than four remain” . As a result, they regulate the market with protection from the state, as the CAI (Immediate Attention Command) of the National Police does not interfere in their business in this zone. The forum called “The hillside speaks to the city” also addressed this issue. They argue that the combos pressure the population to leave when the municipality wants to carry out projects. “With the construction of the metrocable in commune 1, many people were threatened and told to abandon their homes, exactly where the construction of towers and stations was underway”. The vast project of social control of the poor and the internationalization of the city through big events and tourism, not only involves the creation of the Green Belt on the crest of the mountains, but also a set of infrastructural investments: metrocable, escalators, emblematic buildings such as park-libraries, and others that involve vertical interventions in the urban fabric, like the Biblioteca Espa?a. A part of Medellín’s population does not have access to basic services. There’s a housing deficit of 50,000 homes, plus 30,000 in high-risk areas (danger of landslides), and 35,000 households that have been disconnected from water and electricity, or rather, some 300,000 people who could not pay for those services and lost them . That sector, about 15% of the city’s population and more than a third of those living in the people’s communes, would be displaced to develop a city for property and financial speculation. Serna rigorously analyzes municipal plans: “Medellín seeks to position itself as a city regenerated in its urban fabric, pacified and open to the world for international mega-events, whose messages seek to characterize it as a city secure for investment.” But that security, she adds, “translates into high investment in military equipment in the communes so that they also offer tourist potential,” based on works like the metrocable . The militarization of these neighborhoods has, then, two logics: one micro embedded in everyday life, based in combos that control the population; and another macro, linked to police-military presence and equipment. In six years, says Serna, in the neighborhoods they want to evict, six police substations, five police stations, and nine CAI were built, “with which they intend to control neighborhoods with high levels of conflict”. But that mega control, the sum of micro and macro control, is at the service of infrastructural projects that lubricate capital accumulation while strengthening social control. The setoff is that “in less than ten years the administration relocated around 40,000 people to cubicles of only 42 square meters” . But it’s in remote areas are where their survival strategies aren’t worth anything anymore, and where the new urban fabric backfires. 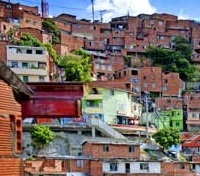 The Inter-neighborhood Board of the Disconnected is one of the coordinating bodies between Medellín’s major communes. It is defined as an “articulation of neighborhood and community organizations on the theme of disconnection from public utility services and housing, which defends and claims fundamental rights for the dignified life of the popular sectors” . The Board has a traveling “inter-neighborhood school,” a training space for commune residents based on popular education. 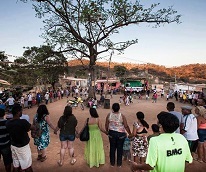 It provides legal advice to defend residents in eviction cases; has women’s and cultural spaces (they do Carnaval , radio-novelas, and have audiovisual groups) and vegetable gardens; and organizes meetings and publishes Vida Digna magazine. In April 2014 they launched the Alternative Urban and Popular Social Forum, parallel to the 7th World Urban Forum organized by the UN-Habitat, in which dozens of collectives based in Medellín, Colombia, and Latin America, participated in four days of debate . Saying that the inhabitants of the mountainside, like those from commune 1, are poor is not enough to understand their reality. A house-to-house survey done in 2010 by the RIOCBACH organization, glued to Bello Oriente, reveals the depth of that poverty . In 20% of families, none of the members work. 7% of households have no income. 32% of households earned less than $45/month and 65% less than $142/month . Only 4% of families brought in more than minimum wage (515,000 pesos or $245 in 2010). Twenty-two percent work in the informal economy, only 11% have permanent contracts, but 38% do “moonlighting” or “make the rounds,” which consists in passing through marketplaces or downtown to get free food and other services necessary for life, a kind of thinly disguised begging . There is a long tradition of community water systems in Colombia, as much in villages and rural communities as in cities. As Vida Digna magazine notes, they are “popular structures around water management,” common among indigenous, black communities, peasants, and the urban poor. “Their origins are in the neighborhood, in forms of solidarity, in respect for the environment and the customs of each of the communities that joined forces in an ancestral way to meet their needs” . There are more than 11,000 community water systems in Colombia , and dozens in Medellín. They are forces that reflect and affirm the autonomy of popular sectors. For that reason, they face a constant battle to defend their rights and their organization. Carlos Olaya, “Nevermore Against Anyone. Cycles of Violence in the History of San Carlos, A Town Devastated by War”, Medellin, Raven Publishers, 2012. The Red compose: ASOMUJPAR (Association of Women breadwinners of Paradise), JAC (JAC) ROOTS (Collective Historical Memory of the Commune 3) Table Interbarrial Disconnected Kolectivo Kultural, Sumapaz Foundation , neighborhood Committee for the defense of territory, Paloma Foundation, Audiovisual Collective Smoke Signals, plus external organizations. Convites is collective community work. The case of Library Park Spain (photo) is the best example of a poorly made investment: seven years after its inauguration it was falling and its repair reflects the costliness of the entire pharaonic work. RIOBACH, “Community Diagnosis Alternative” Medellin, October 2010. According dollar exchange rate in 2010. Dignified Life, Bulletin Board Mesa Interbarrial de Desconectados, N! 26, February 2015. The Spectator, March 21, 2013.